Social media is about connecting with your customer base. That means understanding not only who they are, and what they are interested in, but also how they spend their time on the web. By thinking like the people who frequent (or could frequent!) your operation, you have an automatic step-up on repeat-business. That’s because if you focus your attention on the social networks where your customers hang out most often, then you’re on their minds that much more often. So, how do you know where your base is hanging out on the social web? First of all, let me emphasize that almost all of them are certainly spending some time on Facebook. If you don’t yet have a Facebook page for your farm or business, get that in the works today!! If you rarely spend a moment on ‘the book,’ you need to recognize that you are in the minority and that a lot of people are spending hours (yes, I said hours) on Facebook daily. I’ll bet you are seeing potential now, aren’t you? 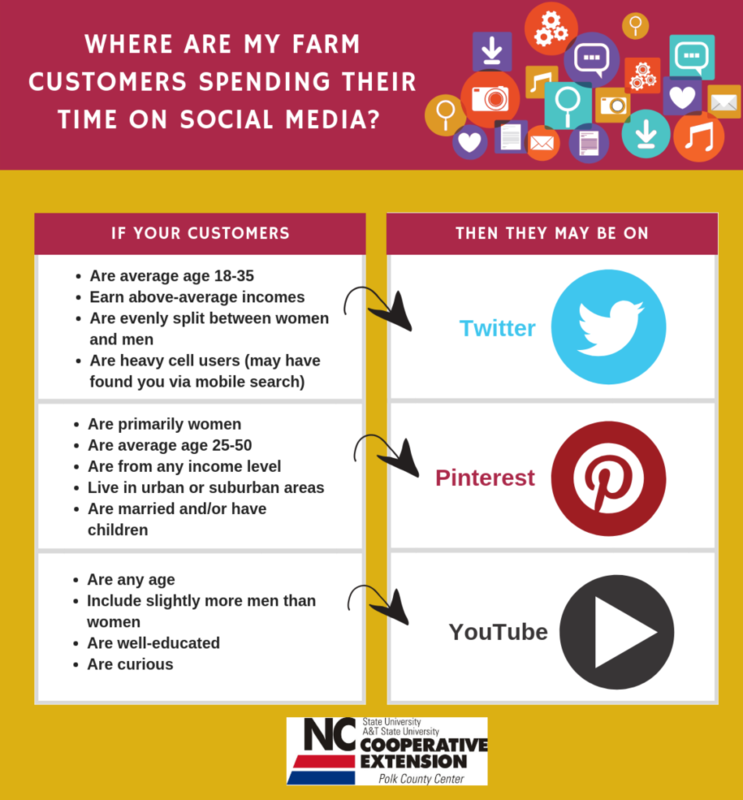 Having a live and updated Facebook presence is a MUST for your farm or agri-business. If you’ve already got Facebook in the bag, though, you don’t want to put all your eggs in one basket. (As if you could..is it laying season for you, too??) You may be wondering if there are other social networks you should focus on to keep your patrons engaged. To help you identify where they are spending their time, the following chart may give you some insights. At the end of the month, take an inventory (no, relax…not that kind of inventory) of what worked and what didn’t. Did you gain new followers? Did the followers you have become more interactive with your brand? Did anyone share your content? If you can answer “Yes” to any of those, congratulations…you may have found a new way to grow your customer base! If not, maybe give it one more month before making your final decision to throw in the towel with your experiment. Either way, you will have learned more about your customer demographic that can benefit you in other areas of your business endeavors. Interested in other areas of marketing your farm or agri-business? Check back soon on the N.C. Cooperative Extension, Polk County Center website for another installment of Marketing Minute for Farmers and Agri-business Owners.